Prior to joining the CFL, Jack Abendschan played football with the University of New Mexico where he was a three year starter and twice named All-Conference. Abendschan joined the Saskatchewan Roughriders in 1965, as an offensive guard and placekicker. Over his ten year career with the Roughriders, Abendschan won Western All-Stars seven times and CFL All-Stars five times as an offensive guard. As a placekicker, Abendschan had a career total of 159 field goals, and 72 singles. He led the Western Division in scoring in 1969 and 1970 with 110 points each year. He led the Roughriders in scoring in 1971 (94 points), 1973 (110 points), and 1975 (62 points). 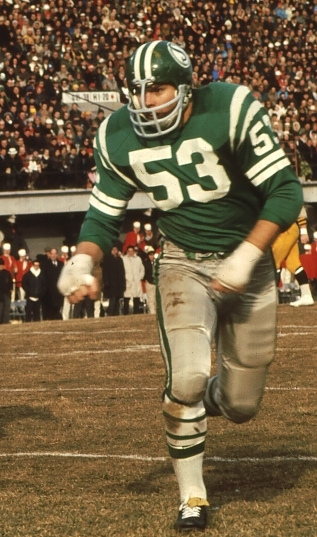 Jack Abendschan played in four Grey Cup games and was a member of Saskatchewan’s first Grey Cup championship in 1966. He is also a member of the Roughriders Plaza of Honour and the University of New Mexico Hall of Honor.